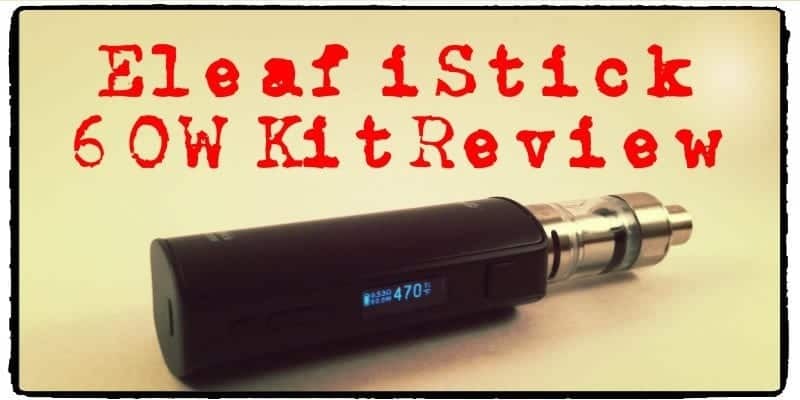 We review today one of the cheaper TC mods out there - The Eleaf iStick 60W. The opinions out there are kind of controversial - you either love iStick or hate it. Considering how low is price of the Eleaf iStick 60W TC mod and how many positive features it has, it definitely stands out from other inexpensive mods and I found it working better than some of the more expensive TC mods. There is a 10 watt istick, by the way. I have had them all, (10, 20, 30, 40, 50, 60, 100) at least one of each. I have sold many of them to customers. Time and time again, they break because they are simply not made well. They are not worth the cheap price anymore. With all the different devices to choose from (and I have seen some really nice devices for way below istick 50watt prices) we don’t have to buy them anymore. The 510 connection can’t take any normal wear, the wiring is crap, it’s a cheap product that’s not worth the super low sale price. I won’t buy another. Between my group of “vapers”, about 6 of of us, we use 30, 40 and 50 watt units. 40w was the fav and then just recently we bought 2 of the 60w units. one is used with the new ceramic coils in TC mode, the other is Power. I did try the Ti coils but wasn’t impressed either…but overall I agree with your review. This combo for the money is a good solid unit and Im sure we will be buying a few more. This mod is crap! i purchased one new, used it about 4 mos. with a Aspire Triton V2 and it totally shut down on me. I contacted ISmoka and after asking me several questions, we determined it had a factory defect. They then told me it was out of warranty and to basically go blow and thank you for buying this piece of garbage. It’s crap, spend a little more money and get a better model mod. I will never purchase any ILeaf product again! I like the mod and use it with a nautilus. Haven’t caught on to sub ohm vaping. 4th istick product but I keep going back to nautilus and mini for above ohm vaping. Worried that the industry might lose us in their quest for fog. I assume since you are new to vaping you are using a tank and not an RDA (rebuildable dripping atomizer). Taste depends on first the quality of juice you are vaping, steep time, etc. If you have a good tank and quality steeped juice, try adjusting the wattage and temp until it tastes to your liking. I would’ve cautioned you against purchasing the Eleaf 60w mod however, turned out to be a piece of junk to me IMO. I would encourage you to keep researching on getting good taste out of your juice. There are many, many methods and opinions available but consensus is: buy quality juice and equipment. Vape on brother! The 60w iStick was my everyday vape these last four to five months. Every single box mod I own is an Eleaf iSticks, I’m a loyal customer. Out of the six I have used in the last eighteen months I like my 60w the least. It’s not made as well in my opinion. The color of the adjustment buttons wore off within three weeks of buying it and it doesn’t go in my pocket or purse so it wore off by my changing the temperature a few times. I also think the adjustment buttons are poorly placed as I was constantly changing the mode when I wanted to adjust my temp a wee bit. They’re too close together and I have little girl hands. It’s also just not as comfortable to hold as all over my others are. I don’t hate it and some people, hell probably most people, will love it. It’s definitely worth the money and it’s a quality vape mod. It just isn’t the best product that Eleaf has put out. I’d still recommend it to my friends. Great!! I love this mod. I can’t see myself buying any other. I can go on for ever all the positives but just to sum it up its FANTASTIC!! Thanks I love mine! It is so simple. I am going from American Spirits to vaping and the TC60W is making the transition so smooth! !